FM students and program director Prof. Dr. Randall inside “the meeting room” at the European Union Council where high-level policy discussions take place between diplomats from member states. 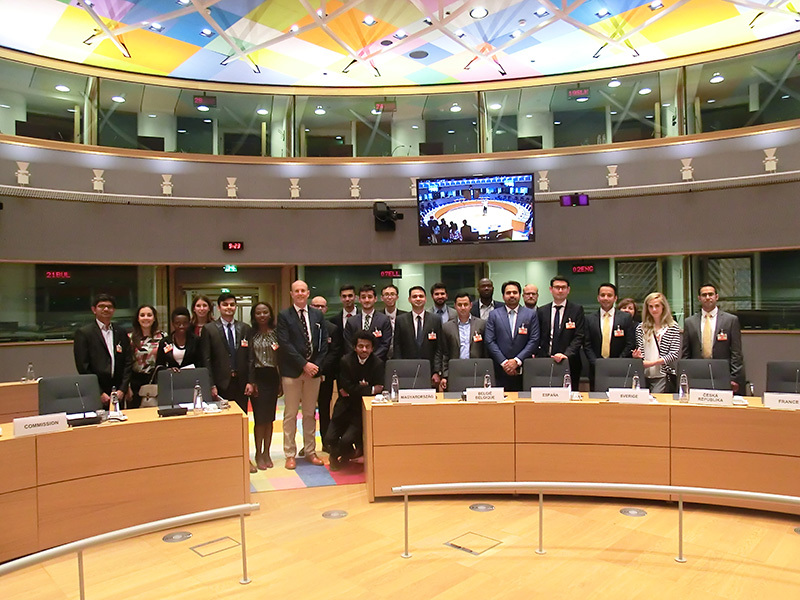 Recently students from the MBA program Financial Management visited Brussels to discuss strategic issues in European politics. On Day 1 the academic excursion started with a guided tour of the European Union Council. Thereafter, Mr. Frank Högemann spoke about the complex and balancing role and function of the EU Council within the European Institutions. The European Parliament was next on the students’ schedule where they not only could visit the Plenary Chamber but also discuss with our Member of the European Parliament (MEP) Monika Hohlmeier’s team regarding Bavaria’s role and representation in the EU Parliament. One of the key topics was on security and migration with the Coordinator of the Task Force Security Union at the European Commission’s Directorate-General for Migration and Home Affairs (DG HOME), Mr. Bessot. The venue was the Representation of Bavaria. Day 2 began at the European Commission for a half-day information visit. First, Dr. Galluccio, member of the European Commission’s speakers’ team and author of several books on the topic of international negotiations, introduced the students to the role of the Commission as the Political Executive of the EU. They also discussed potential scenarios regarding the future of the Union, depending on the choices Europe will make. Thereafter, Ms. Kiel spoke about cooperation within the EU in the area of migration and security and Dr. Zedler explained the EU response towards terrorism. These 2 talks were among the most interesting presentations of the entire study visit. In the afternoon, the participants had a lively dialogue with Mr. Herzog, NATO on the current challenges facing the Organization, esp. response towards organised crime and terror, cooperation in the area of Security and Defence and cyber defence. Afterwards, they visited the European Committee of the Regions (COR) where Mr. Klaus Hullmann, a former lecturer in our faculty, introduced them to the Committee’s role as an advisory body to the EU Commission, Parliament and Council. The students finished the day with a guided City Walking tour 1.000 years Brussels: Legends & History. On Day 3, they visited the second advisory body to the EU Commission, Parliament and Council – the European Economic and Social Committee (EESC). The students experienced an insightful presentation and lively discussion about the function and the activities of the Committee as well as on capital markets union (CMU). In the House of European History, which only opened a year ago, they went on a fascinating journey through the history of Europe. 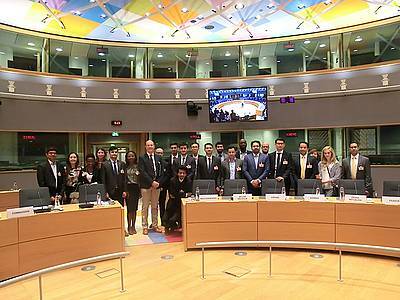 To the students, the study visit provided valuable insights into policy-making on the EU level. They learned about the challenges the EU is facing and possible scenarios regarding the future of the Union. As the majority of FM students come from countries outside of the EU, this helped them to better understand the current political environment and security dynamics within Germany and the EU. A tremendous experience. We also use Google Analytics to analyze the usage statistics. You can disable the future analysis of your website visit.